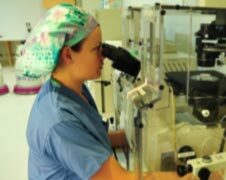 Danielle Albini serves as our Embryologist, and manages all coordination and monitoring of egg freezing and egg retrievals. Danielle received her education at California Polytechnic State University, San Luis Obispo where she specialized in clinical embryology. She has over six years of embryology experience and has been a member of the Santa Monica Fertility family since early 2009. Danielle has always been interested in the reproductive sciences and is very passionate about her career. Embryology was a natural fit for her. When she’s not working in the lab, she enjoys crossfit, organic gardening and raising chickens for their eggs.